Lately, it's been ideal for tracking people who are buying or picking up freecycled stuff. Speaking of material possessions, last night I literally sold my computer desk from under my computer, sold my snowboarding gear, and gave away 5 guided meditation tapes. Each item that leaves my apartment has me feeling a little lighter. The extra cash is nice too. The last two big items are a set of curtains, and a night table. Then the rest is going to my parents or storage. I have 3 full days of work left before I wrap up my leadership training, and turn in my resignation. Living la vida loca! PS – for those with eagle eyes, note 10/30 marks the start of “Everest 2” on the Discovery Channel at 10pm. I watched the first Everest about 10 times (all 6 episodes). Check it out if you can! PSS – looks like I'll also be around to catch the second half of the Man vs. Wild season airing in November (in the USA), featuring 2-hour episodes, including the one where Bear Grylls flies over Everest using a super-powered fan strapped to his back! Life on a white board? It’s very “Office Space” – I like it! I just started seeing the commercials for “Everest 2”. I figured last season was just a one-off mini-series but I’m so stoked that it wasn’t. Yea, I was wondering if they were shooting a second season this past May, as I heard that some of the people profiled from last year’s expedition were going for it again. Unfortunately, I already know about whether two of the guys made it to the top or not. Still, I’m excited to watch this year’s season. I like the way the soundtrack has an eerie, echoing “everest, everest” in the background. Quite spooky! I have just started to follow your adventure. 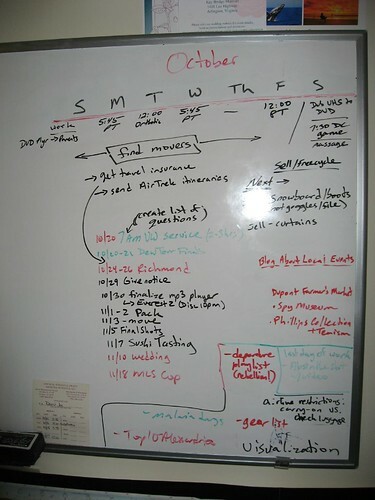 A white board…great idea. I must see if I can catch Everest 2. If you decide to stop in Korea, and have any questions give me a shout. I’ve been living here for almost seven years. Ah! I LIVE by the whiteboard! Mine is smaller and I updated it every day with my daily plan – after seeing yours I think I want to get a giant one and start plotting some longer term adventures! Will you travel with your whiteboard…? Anyway, great idea…maybe you can sell it on ebay before you leave for some additional travel funds.